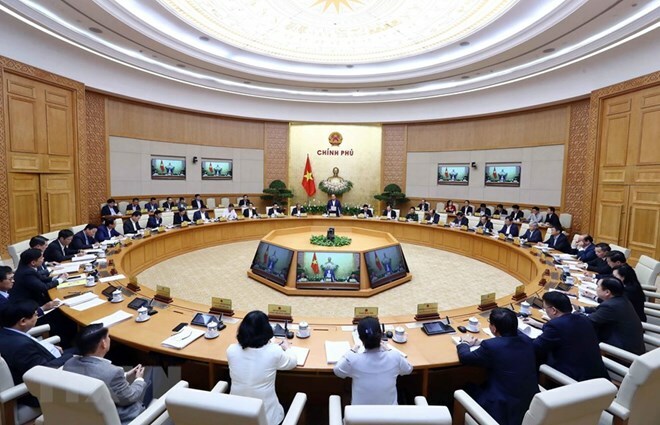 Hanoi (VNA) – Vietnam saw positive developments in many socio-economic aspects in the first quarter of 2019, with a GDP growth of 6.79 percent and stable macro-economy, said Minister-Chairman of the Government Office Mai Tien Dung. Briefing the media on the outcomes of the Government’s regular March meeting on April 2, Dung said that the consumer price index (CPI) in March dropped 0.21 percent, resulting in an average CPI rise of 2.63 in the first quarter of 2019. At the same time, total retail and service revenue in the period increased 12 percent, while trade surplus in March hit 1.56 billion USD. The number of newly-established firms was 28,451, up 6.2 percent, and the number of companies resuming their operation was over 15,000. However, at the meeting, Prime Minister Nguyen Xuan Phuc pointed out that the Vietnamese economy is still facing many challenges. African swine fever, foot-and-mouth disease, unfavourable weather, and unstable farm produce prices are threatening the agriculture sector, he noted. The PM said that the disbursement of development investment in the state-owned sector has been low, while state budget disbursement has reached only 14.7 percent of the yearly target. Meanwhile, the centrally-managed capital’s disbursement fell 30.5 percent year-on-year. The growth of the industry and service sectors has slowed down, while credit growth has been low. Dung said that during the Government’s meeting, the PM asked ministries and sectors to focus on creating breakthrough steps to ensure that this year’s growth is higher than that of 2018. The Government leader asked ministries to explain causes behind the slow capital disbursement and offer up solutions.